I'm super pleased to be taking part in the Blog Tour for Rosie's fabulous new book, No Patterns Needed. If you're not yet familiar, Rosie's new sewing book consists of 15 sewing projects that you make without the use of a traditional paper pattern. Based on three shapes (circle, rectangle and triangle) you use good old fashioned math to create the patterns (straight onto fabric or newspaper). It's such a cool concept not to mention fun to do. For me, what separates Rosie's book from others, is that the patterns also have a great urban style about them. They're fresh and fashion-forward compared to what's currently out there in the sewing world, and I'd definitely love to make and wear them all. For the blog tour and Rosie's book launch that took place in Shoreditch last week, I decided to make the Cape Sleeved Top. My decision was a direct result of the fabric I was working with. 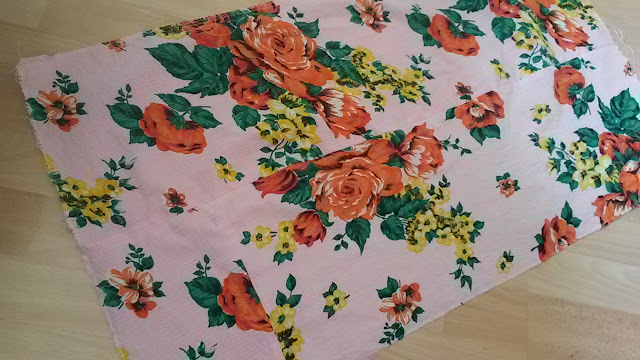 As you may or may not know, I am on a mission to work through my stash, particularly the range of vintage fabric I still have from Mr Szabo's grandmother. I've always been drawn to this large floral print. It's so pink and feminine. So um...not me. But I've always liked it and when Rosie's book landed on my door mat, I knew it was destined to be teamed with something a little edgy and cool. As soon as I saw the big, statement sleeves and the cropped hem on the Cape Sleeved Top, I had a big fat vision and grabbed my metre ruler, chalk and set to work. The whole process of using Rosie's book is quite fun. At the beginning of each project, Rosie gives you instructions and neat little boxes to record your measurements. You use minor mathematics to ascertain the pattern measurements and shapes you need to cut. The Cape Sleeved Top is relatively straight forward. 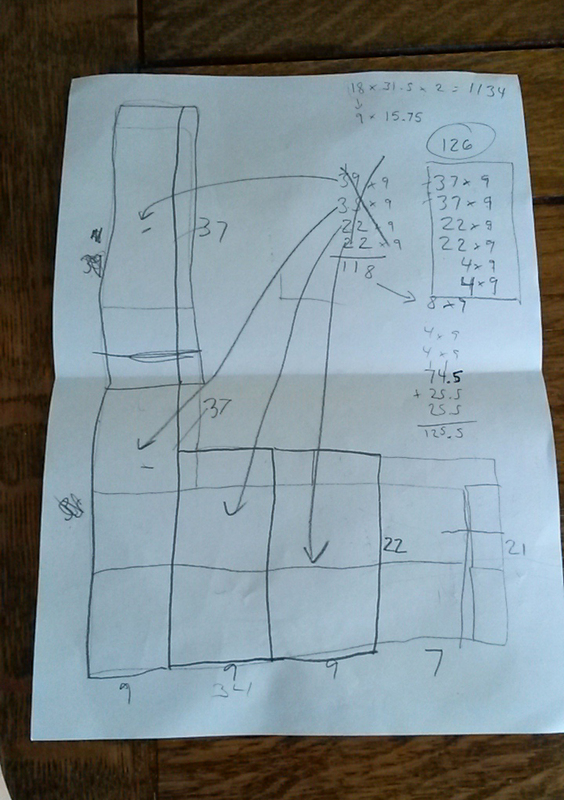 It requires two big rectangles for the front and back, and a further two for the sleeves. However, of course, my vintage fabric was not going to give it to me easily. Having cut the front and back, I thought I'd check ahead to see just how big the sleeves needed to be. They are HUGE! That meant I had to jump a few steps forward and roughly estimate the measurements of the constructed garment, working backwards from there to see if I'd have enough for the neck facings and beyond. The answer was a clear NO. But I wasn't going to quit. Instead I recruited in the Szabo marine corps, a.k.a Mr Mike Szabo. Basically, I was left with a large long L-shape of fabric. One sleeve block would have fit in the bottom of the L, but the spine of the L was too narrow and long. So, here's what we did. In the end, once the sleeves were gathered to create the big awesome flounce, the added seam lines gave the floral fabric a bit of dimension. Even Rosie asked if I'd tweaked the sleeve pattern. As Bob Ross used to say, happy accidents! The rest of the project was a breeze and a lovely quick make. For the facing I used a light cotton lawn from my stash and the zip also came from my stash of chunky metal zippers I want to use up. 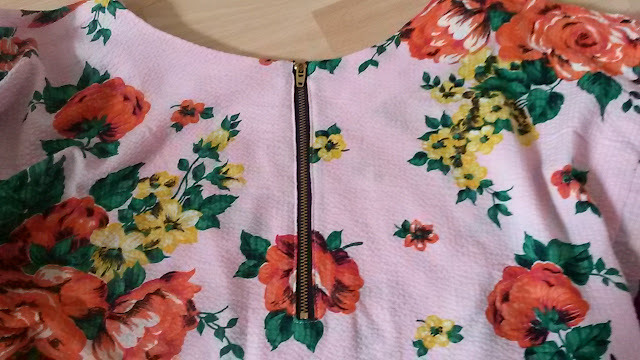 The zip I used is actually navy, but works really well against the pink and the flowers. Black looked too harsh and seemed to cheapen the outfit somehow. I really love wearing this top - it's so different for me and has a stylish novelty feeling. The colour really works well against denim and the boxy shape doesn't make it overly flouncy or 'pretty'. I'm also so surprised at how well it fits considering there is no standard pattern. 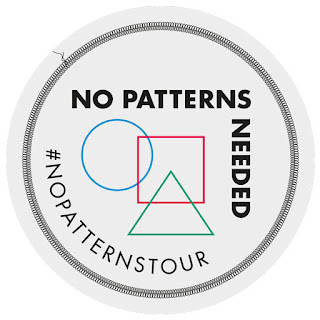 There are also considerable options for each pattern, and a couple of these are showed at the end of each 'chapter'. For the Cape Sleeved Top, one of Rosie's variations is a dress which works really well - plus you could no doubt come up with your own by tweaking the measurements how you want. 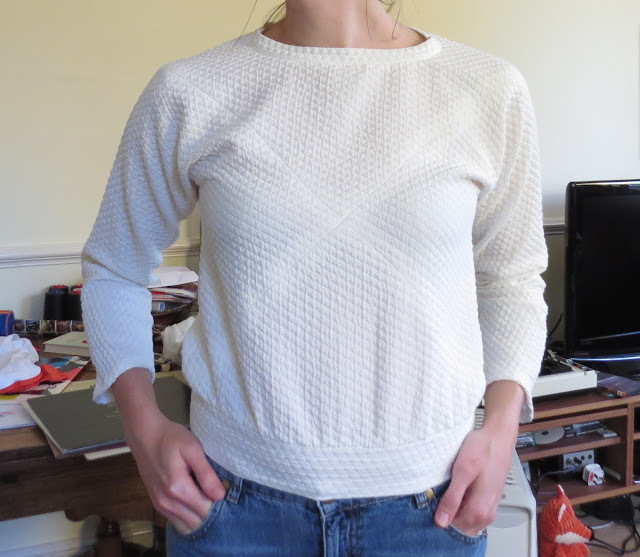 Last year, I tested the 4 Slice Sweater for the book, which is probably my favourite project in the book. I am really looking forward to making that again especially after seeing Rosie's version using fluffy fabric for one of the triangle pieces. This was a tester version and I'll make it bigger and more 'boyfriend' in fit next time. My waist band was too small because my fabric didn't have the right stretch in it and oh yeah, I had given birth 6 months prior and was still living on cake, but I thought I'd include the photo I took to show how cool this pattern is. I now wear this sweater a lot because I've lost some weight and spend my time running after a defiant crawler. River not Mr Szabo. I can't recommend this book enough. It's refreshing to not have a standard pattern to cut and feels quite liberating marking your measurements directly onto the fabric (if you choose to go maverick like me). As I mentioned above, it seems like there are multiple options for each project, which is such great value for money. Congratulations to Rosie for a truly, innovative, clever sewing book. Preppies, Knitters & a New Feature on the Blog packed with Free Sewing Stuff!